Since the impounding of the Three Gorges Reservoir, the channel of the Yangtze River has become a busy watercourse and the probability of landslide-induced tsunamis has increased. In the case of landslide-induced tsunamis in the Three Gorges Reservoir, even after shipping closures in advance, there are still facilities and objects in urgent need of protection within the risk zone of the watercourse, such as wharfs, marine fueling stations, berthed ships. The emergency protection against and decay of landslide-induced tsunamis in inland watercourses is a new challenge. In this study, 37 sets of wave decay experiments were conducted with the hydromechanics numerical method. The wave decay efficiencies of common simple structures including submerged horizontal plate, horizontal plate on the water surface, inclined thin plate and cross-plates in coastal areas were compared and analyzed. Cross-plates structure showed better wave decay capacity than other simple plates. The wave decay performance of cross-plates was related to five modes of energy dissipation and transformation, namely run-up/run-down, overtopping, reflecting, return flow and disturbed wave orbital path. The type of wave had little relation with the decay performance of cross-plates, but a strong correlation with cross-plates structure, especially the height of the vertical emerged plate. The best decay performance was observed when the ratio of wave amplitude to emerged vertical plate height was between 1 and 1.5, which can reduce up to about 80% of the incoming wave amplitude. Finally, the emergency way of cross-plates applied to the decay of landslide-induced tsunami in river course is discussed. This study provides a conceptual reference for related studies to practice the attenuation of landslide-induced tsunami in reservoirs. The paper is funded by the National Natural Science Foundation Project of China (41372321) and China Geological Survey Project (121201009000150018). 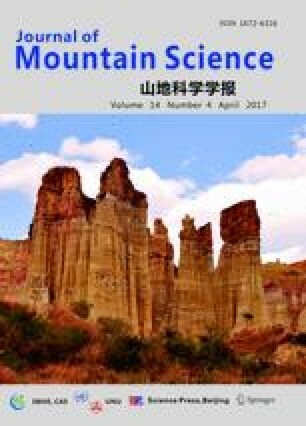 The authors want to express their gratitude to Prof. YIN Yue-ping from China Institute of Geo-Environment Monitoring, who encouraged the authors to explore and innovate in the field of impulse waves generated by landslides.